Mendoza has been the giant star in my map for this trip as a whole. With the premiere wine region for Malbec in the entire world, and many other varietals to drink, I have been looking forward to spending time here for a while. As I soon found out on arriving, it did NOT disappoint! Mendoza has a fairly large city area, filled with parks and plazas, with wide streets and cobblestone pathways. The architecture in this region is very uniquely designed. In 1863, there was a very large earthquake that absolutely destroyed the city. Because of this, the city was rebuilt with the next earthquake in mind. There are wide streets and sidewalks with covered drainage ditches along every road. That way, the next time a large earthquake comes, there is space for all of the rubble to fall. The drainage areas also account for all of the rainfall and water that comes through the city. This leaves a look that has wide streets with many trees, parks, and plazas. It’s as unique as it is beautiful. We spent a few days in the city itself to explore and experience Argentinian culture. 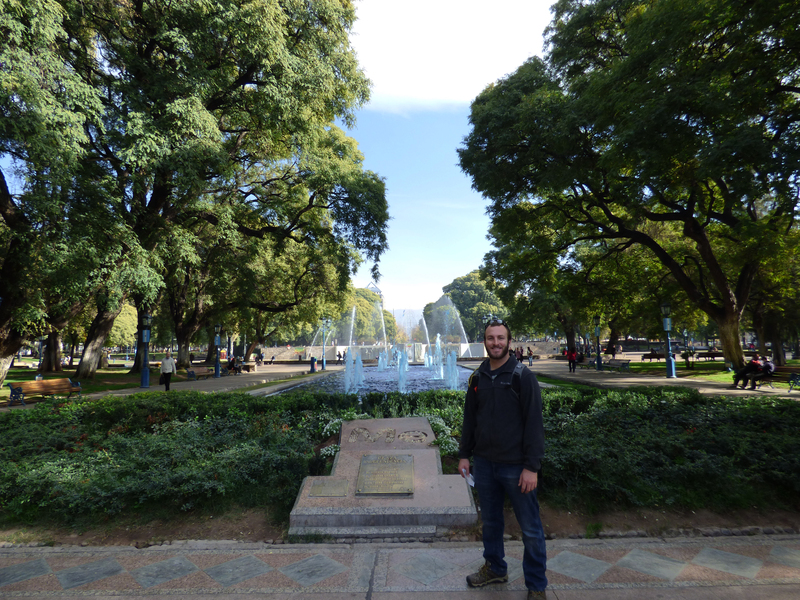 Our first day out and about, we walked to the main square, Plaza Independencia, to eat lunch and finally taste the helado that Argentina brags about. As we meandered down the street, we were suddenly surrounded in every direction by locals on a march. We weren’t aware at the time, but the march had started on all sides of the city and was coming together for a huge event in the main square! We walked with them far enough to move out of the way, and settled in at a cafe to watch the events transpire. The news was on, and apparently this protest/march was happening across Argentina! Images flashed up from Buenos Aires, Cordoba, Salta, and many other cities including Mendoza. It was a march against domestic violence. Groups of people from all different opinions, religions, and political groups came together to represent their groups and their support during the day and well in to the night. It was quite amazing to see the variety of people, dancers, and students that turned out for the event. Despite all of the action in the city, we still had time to see quite a bit more. I’ll start with the helado. Helado is spanish for ice cream, but better. 😉 They have heladerias on every corner with more flavors that we can count! I had blueberry, vanilla, and strawberry on my cone, while Chase got pistachio, orange, and vanilla. THEY WERE INCREDIBLE. Let me tell everyone: Argentina’s ice cream is equally as impressive as it’s wine! It is an art here! It was delicious, smooth, and incredible. 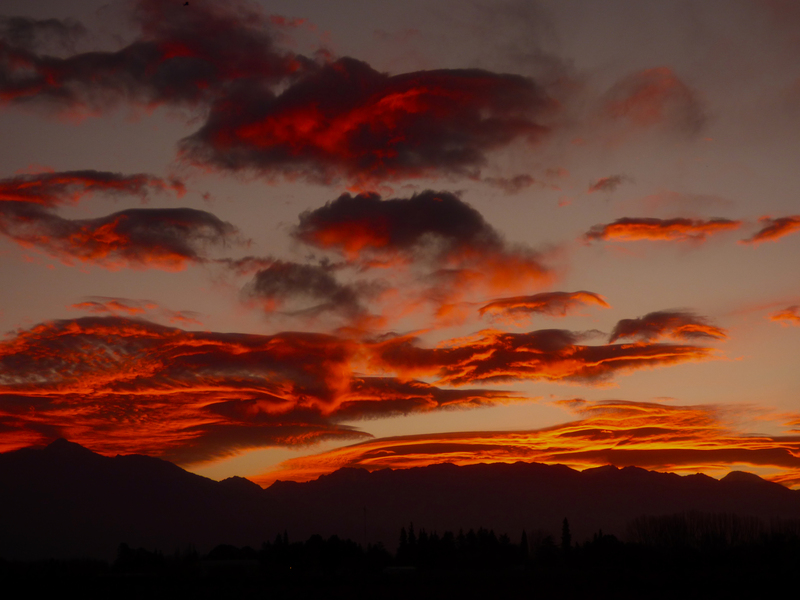 As with many of the cities in Argentina, Mendoza is rich with culture and history. They are very proud of their history, and eager to help the tourists learn about it as well. Statues, museums, and bike rental shops fill every corner of the city. Right outside of Mendoza lies Maipu, where we got less city and more farmland. The local busses in Mendoza go every 15 minutes down to Maipu, so we hopped on at 7:30 am and arrived just as the sun was rising. We had been incorrectly informed that all of the bike rental companies open at 9, and ended up with an extra hour to kill as we sat outside waiting until 10. So, when a man came out and started waving us over to his bike company, we jumped at the chance at an early start. This was a mistake. There is a good reason that not many people use this bike company! When we first started to receive bikes, I noticed a sketchy tandem bike sitting in the corner. I INSISTED that we should ride it, and thankfully, Chase (the more level headed at that point) asked to test ride it first. It was so much fun trying, but after about 4 feet on the rickety bicycle, we tipped over. Goodbye, tandem bicycle. That ended up being a pipe dream for me. Chases insists that if we were to ride one that wasn’t broken, we could do it. I, however, have inserted tandem bicycle under a list labeled “Deathtrap Ideas”. Just say no! Due to my dream of riding a tandem bicycle fizzling out, we received their standard bike. As we began to pedal off towards the vineyards, my seat swung wildly with every movement, and Chase’s bike wheel was so bent that the tire changed direction with every rotation! We then made our first official stop bringing the bikes back to switch them out. After much more pickiness, we received our new bikes. The total length we rode each day was about 30 kilometers. This is not so bad on a road bike. On our mountain bikes it was an entirely different story! Let’s just agree that without all of the wine I drank, I have no interest in road biking on a mountain bike EVER again. 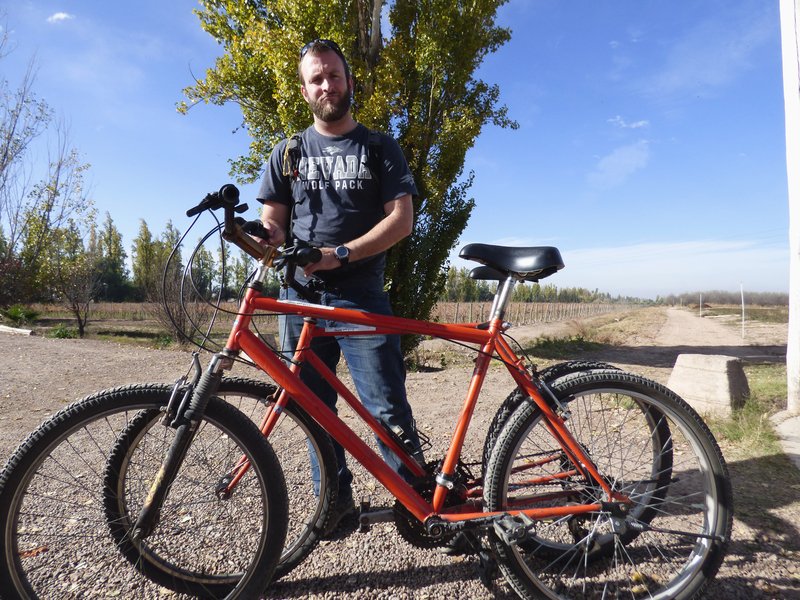 The second day, we rented bikes from a different company, Maipu Bikes. They gave us hybrid (but closer to a road bike) bikes with big, comfy seats. This was an awesome upgrade! The second day was an equal distance, easier, and just as enjoyable. For future travelers, use Maipu Bikes or Mr. Hugo bikes. I would not recommend Orange Bikes ever again after the multiple bicycles we used. Chase frowns at the smaller bike he received. Carinae: This winery was our first in Mendoza. It was Chase’s favorite for the first day and I enjoyed it as well. They are a younger winery, and most of their wine is younger as well. Their younger wines are a lot better than most we tasted in the region, and although they were the first winery, I did appreciate the quality of their wines after comparing to the following wineries. My favorite wine was their Octans blend. 68% malbec, 32% cabernet, this wine gave me bold flavor with a smooth finish. It was still a bit soft, and very unique in it’s flavor. This was my first experience displaying the drastic difference from the wines, especially malbecs, that we find in the states. Familia Di Tommaso: I adored this winery! It is small, but the oldest in the area. First founded in 1869, they began with old fashioned wine-making and still incorporate it into wine making today. They use giant, concrete barrels instead of the newer stainless steel tanks. Their wine has a unique spice to it as well. My favorite was the 2012 malbec reserve. It was dark, bold, with just enough spice to make it worth noticing. Because it got 18 months in barrel, it had strong notes of plum and currant to round out the flavor and give it complexity. YUM! Tempus Alba: This was wine and lunch on day one. We tasted 5 wines, and the one I was introduced for the first time was the Pleno. This is a red wine, that is slightly fruity, but with a kick. the sweetness was a little more than I usually go for, but still enjoyable. Along with the wine, we had a true Argentinian steak. These people don’t lie when they claim the best beef in the world. To this day, that steak was the best I have had in my entire life. Viño El Cerno: This was my least favorite winery. As for looks and customer service, it is beautiful! As for the wine, neither of us were impressed with the young, middle aged, or reserve wines! It reminded me a lot of the style that the US has in the form of Malbecs, with too much pepper and spice with no complexity to round it out. However, they give full glasses as the tasting, so we split one tasting price, saved money, and still left with a buzz. Mevi: Mevi was a delightful winery. We met another group of 6 people here that we shared the experience with and chatted away as well! The wine tastings come in sets of 4 wines, young or reserve. We selected the younger and politely asked if they could upgrade a single glass to reserve for the same price and they graciously accepted. The wine was great, and the notable wine is their Torrontes. Torrontes is a white wine and much less common in the United States. It is smooth, fruity, but dry enough to make a white wine hater give a nod of respect. Chase, for example, is big on red wines and not fond of the fruity, sweet white wines. The torrontes white wines we have tasted have truly given him something to start thinking about white wine-wise. Trapiche: This was the start of day two! Trapiche is Argentina’s largest producer of wine. They ship their wines out to over 40 countries and produce 40 billion liters annually. Their bodega has a Napa feel to it, including the tour price. This was well worth it, however, since the tour guide had us as a group of three. He explained everything and even let us stick our heads under the spout to taste the wine that was set to be bottled the next week! Our favorite bottle here was their 2010 Malbec, Finca Suarez Lastra. It spent a good amount of time in barrel, which allowed it to form a complex, rich flavor with hints of vanilla and fruit. I was so glad we got to taste the bottle, since we were unable to buy it. Bodega La Rural: This winery was also home to the museum of wine. When we arrived, they weren’t doing another tasting for 2 hours, so we only got to tour the museum. The museum was fabulous! From the origins of wine making to today, they had the entire history to read, feel, and touch. We learned so much about the history and were able to appreciate it even more due to all of the lessons and tours we have taken here. Bodega Domiciano: This was the last of our wineries for day 2. They are a smaller, boutique winery and only ship their wines outside of Mendoza. The wines were a solid okay, but we only got the opportunity to try two of them. We asked for the opportunity to try more, or even pay to try more, but they do not provide that service. We were pretty bummed. The wines we tried were the youngest, cheapest wines they sell. I have a feeling that if we were to try something that spent time in barrel or even was made differently, we would have liked it. I was still surprised that we didn’t like their young wines though! Many of the wineries make great younger wines that sell very well! This winery was an exception. Our last experience in Maipu tasting wine was the local wine bar. We paid 3-4 dollars for a 5 wine tasting, and at the end of the tasting, we received a free bottle!! My free bottle was one of the wines we tasted that I had simply loved, and Chase’s free bottle was from a nice little batch of the owners home brewed wine. The owners were friendly, easy to get along with, and quite entertaining as well. It was a truly great experience to bond with new friends, taste good wine, and experiment with locals and their home brewed wine. Other great places to visit while in Maipu include Tierra Del Lobo and Entre Olivos. Tierra Del Lobo is a great little place down the road from Trapiche. The owner, Urs, makes liquors, liqueurs, and grappa on his property.We got to taste 12 items and even taste some of the liqueurs with new flavors that he is considering introducing. At Entre Olivos, we got a tour and unlimited tasting of their olive oils and marmalades, and then 2 free shots of the liquors they make as well! It was a way add to the wine experience with something new and still native to the region. After 2 great days in Maipu, Chase and I took a three hour bus out to the Valle De Uco. For anyone who goes there in the future, I have one tip: Rent a car! We arrived at the bus station to find a small town with no taxi service, and our hostel to be 2 miles away. Fortunately, I had been chatting with the owner via email to figure this out and she was more than happy to come pick us up at the bus station! Overall, we rented bikes day one, and the owner drove us around on day 2 for a cost slightly lower than renting a car. This saved us a TON of money and gave us an unforgettable experience that I am sure few other have received. We stayed at Casa Boho, an up and coming bed and breakfast open since January of this year. Melisa, the owner, is an amazing girl with a gift for customer service and hospitality. There are only 2 rooms for rent at Casa Boho, and they are well worth it! Right outside the bedrooms lies a vineyard that stretches on for acres! The same goes for across the street. Melisa called the bike rental company and had our bikes booked and ready within an hour. That allowed us to bike to 2 wineries for the day and save time by ending our trek at the hostel instead of town. There, the bike company came and picked up the bikes. On the second day, she offered to drive us to Salentein winery for a lower price than the car service to save us time and money. This turned out to be our lucky day, because as she picked us up, she gave us the offer of the day: her friends were going to a couple of wineries on behalf of hotels in Mendoza (city) in order to have an experience to recommend. If we were okay with this, we could join her and her friends. It was an amazing chance and we enthusiastically accepted. We went to three wineries total that day, and some even had food pairings to bring out the flavors in the wine. It was personalized, special, and absolutely beautiful. The region is surrounded by the Andes mountains on one side, and vineyards as far as the eye can see on the other. Every sunset is beautiful, much like Northern Nevada. O. Fournier: While very much out of the way, it was well worth the almost 2 hour bike ride. It has today’s newest technology in wine-making and research with beautiful vineyards, a large pond, and mountains as the backdrop. We were very impressed with their Beta line of wines, the mid range in age and price. We had our tasting in the restaurant that overlooked the pond, vineyards, and mountains. La Celia: This winery was a great tour. Unfortunately, they sent home the tasting staff 5 minutes before the tour was over, claiming we didn’t need a tasting to pay for a tour. I would love to revisit when we have the chance to taste the wine on top of the tour. Salentein: AMAZING! I loved this winery. It had a great tour, beautiful estate, and wonderful people. They taught us even more about what to look for when tasting wine, and provided great wines in addition to that. 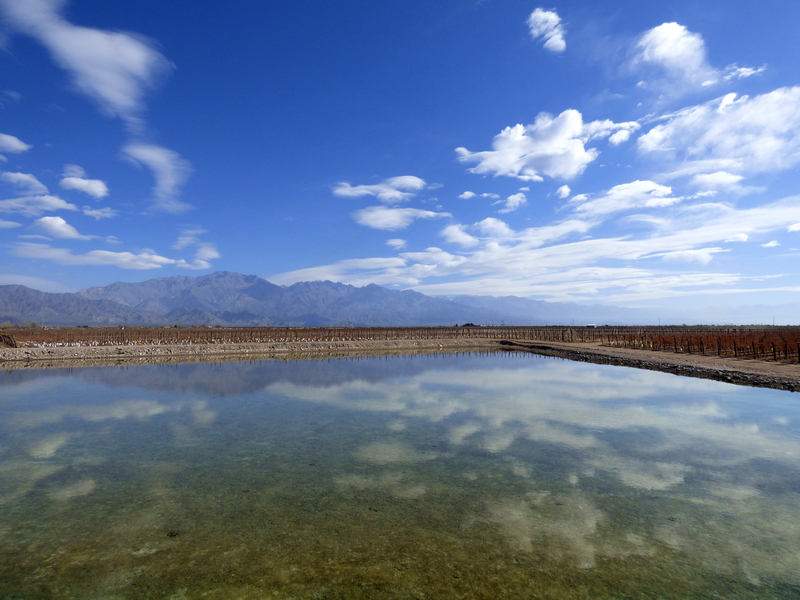 This winery is a must see for anyone who visits the Mendoza region! Gimenez Riili: This winery was a bit more expensive to tour than usual, but well worth it. They included, as part of the tour, tasting straight from the tank, then the barrel, and then the final product as a reserve wine. This allowed us to taste the differences and journey through the life of the wine. In addition to this, they add in 2 more white wines and 4 more reds paired with food to bring out the flavors. They also are in the finishing phases of opening a hotel as well. The Vines: Great winery! We got a private tour, tasting, and food pairing. 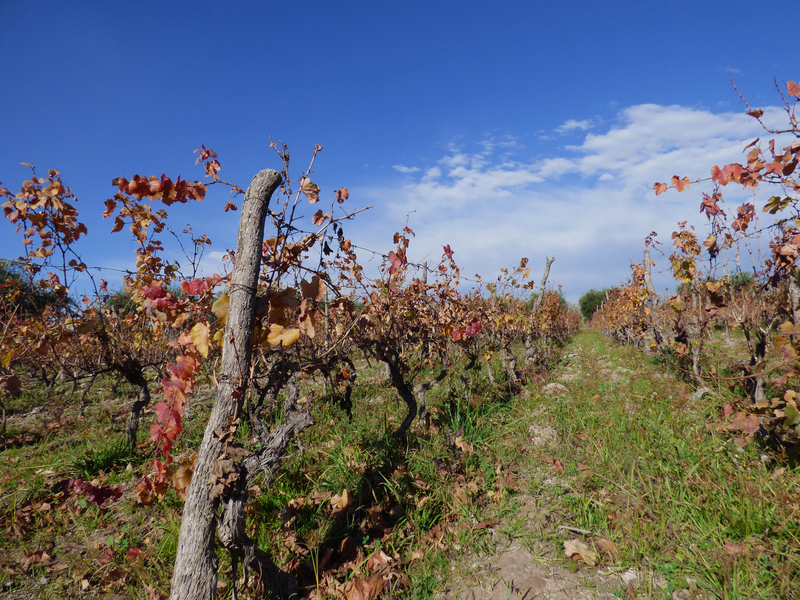 They produce the biggest variety of wines and types anywhere in Argentina! 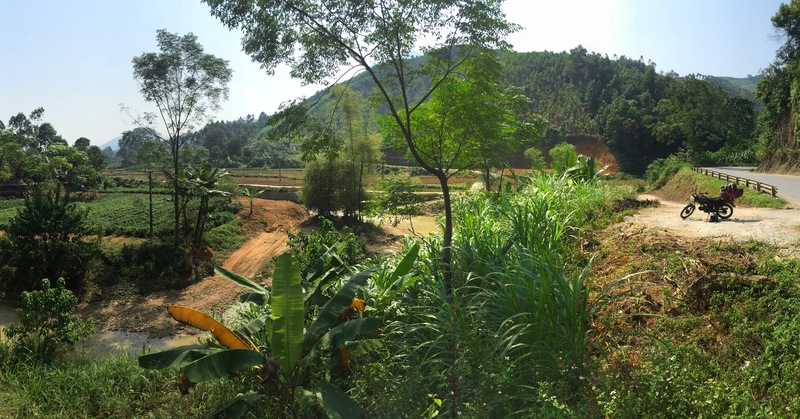 Different plots of land belong to different investors that choose the wine type and label. This creates a variety that brings out the best in everyone! Between Mendoza, Maipu, and Valle De Uco, this region gave me everything I anticipated and more. 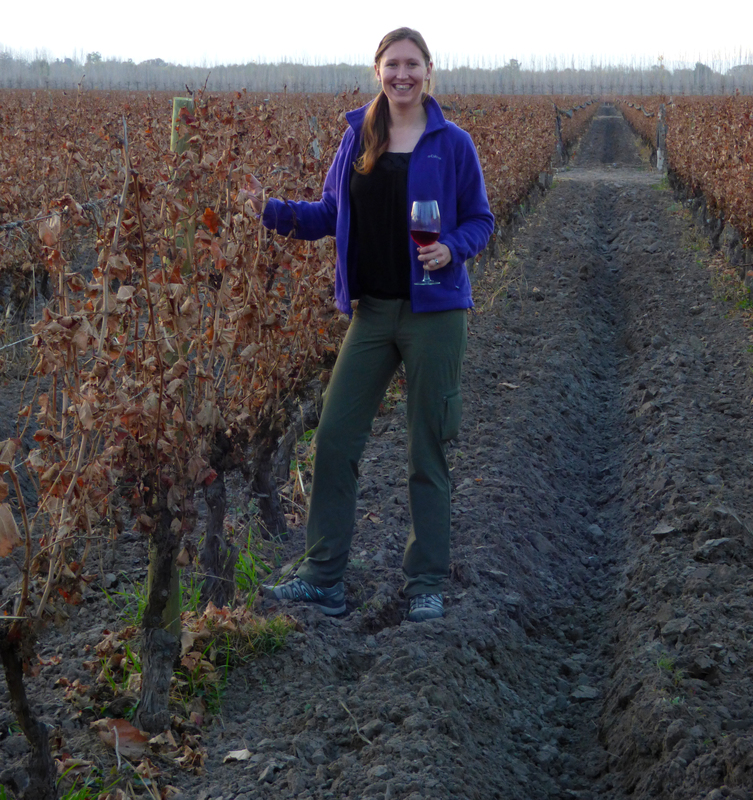 With adventures, great wine, and my partner in crime, we made the most of this part of Argentina. I now have my favorite wine country checked off my bucket list, and I am thrilled!